Golden Valley Llamas01981 240208work Guided WalkWalking with Llamas and Llama Trekking, here at Golden Valley Llamas, is fast becoming a ‘must-do’ activity. 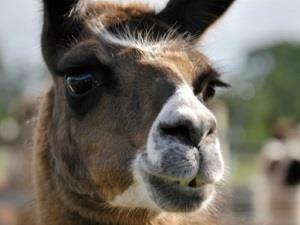 Bond with your llama – get to know him and take him on a walk in the glorious countryside of south west Herefordshire. If travelling from further afield, why not take a two day stay in one of our holiday cottages? Great for adults. Great for families. – You will help call in, catch, halter, groom and walk your llama through our fields and farm, or beyond though the glorious Herefordshire countryside. – Llama Treks tailored to your party’s requirements. From the centre of Ewyas Harold and opposite the Temple Bar Inn, take the road signposted to Walterstone. The road leaves the village, bears sharp right and climbs a hill. The farm is on the left, half a mile from the village centre.